In 2018 we are celebrating the 60th anniversary of Histochemistry and Cell Biology. In recognition of the diamond anniversary of our journal, a series of special anniversary reviews will be published during this year. These anniversary reviews are intended to recall pivotal discoveries in the elucidation of structure and function of cellular organelles and tissue components as achieved by modern microscopic and histochemical techniques together with biochemical and molecular studies, and to provide the readership with an outlook for the fields covered. We hope that you will enjoy these anniversary reviews written by representatives of the many facets of modern histochemistry and cell biology, as well as the excellent original work to be published in HCB this year and in the future. 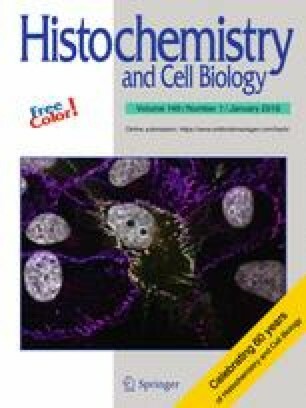 Given the above introduction, it is perhaps fitting and appropriate that the first issue of HCB in 2018 includes a review of the technique of freeze fracture for the ultrastructural analysis of cellular membranes, which was reported about 60 years ago (Steere 1957; Moor et al. 1961). In this technique, aldehyde-fixed cells or pieces of tissues are cryoprotected followed by rapid freezing and fracturing by a microtome in a liquid nitrogen cooled apparatus under a high vacuum. The fracture faces are coated with a thin layer of platinum and carbon, the attached biological material is digested away, and then the carbon/platinum replicas are analyzed by transmission electron microscopy. Now, in this first issue of HCB for 2018, a timely review of the contributions of freeze fracture in conjunction with immunolabeling techniques (FRIL) for isolated cells is presented by Meier and Beckmann (2018). They describe published studies in which FRIL was used to elucidate ultrastructural details and protein composition of gap junctions, aquaporins, tight junctions, and caveolae in cultures of normal and mutant cells. The authors then proceed to discuss technical aspects for the optimization of the multi-step FRIL technique on cultured cells. This review will be a most useful reference for those interested in using the FRIL technique on cultured cells, as well as for general principles on the freeze fracture technique in cell biology. Rezaei et al. (2018) present a detailed investigation into the potential role of endothelial-specific vascular endothelial cadherin in breast cancer tumor progression and metastasis. In particular, they were interested in the “cadherin switch”, whereby tumor development is often accompanied by tumor cell loss of E-cadherin, with a concomitant gain in N-cadherin (Rezaei et al. 2012). They used a diverse group of experimental techniques, including immunocytochemistry on tissue microarrays from 392 cases of invasive breast carcinoma, manipulation and immunostaining of cultured cell lines, PCR analysis of cellular RNA content, Western blotting, and transcellular electrical resistance analysis. Amongst their results they found: (1) strong correlation between the expression of VE-cadherin and tumor size, as well as lymph node stage and expression of estrogen receptor by immunohistochemical analysis of breast tumor microarrays; (2) transfection of MDA-231 cells (characterized as aggressive and poorly differentiated) with VE-cadherin resulted in mesenchymal-to-epithelial transitions in cell phenotype, resulting in altered cell adhesion and substrate spreading properties; and (3) contrastingly, transfection of weakly invasive and poorly metastatic MCF-7 breast cancer cells with VE-cadherin did not appear to overtly affect the invasive potential of these cells, though cell junction formation was altered. Thus, overall their findings suggest that the impact of VE-cadherin on the behavior of cancer cells is directly related to their stage of cellular differentiation, and that this member of the cadherin family has a definite impact on breast cancer cell tumor progression. Invading trophoblasts are important for anchoring the placenta to the maternal decidua during the first trimester of pregnancy by forming compact cell columns. The trophoblast invasion depends on proteases, among them matrix metalloproteinases (Cohen et al. 2006) to digest various components of the extracellular matrix and is highly regulated by oxygen (Huppertz et al. 2009). A low oxygen concentration within the placenta is correlated with high expression level of various proteases. Hiden et al. (2018) aimed to identify proteases particularly important for the invasive properties of trophoblasts. For this, they analyzed 46 proteases out of 56 invasion relevant proteases obtained from a MEROPS database. In isolated primary trophoblasts from first trimester placenta, representing an invasive phenotype, matrix metalloproteinase 12 (MMP12) was the protease with the highest expression level. In contrast, in trophoblasts from term placenta, representing a non-invasive trophoblast population, expression of MMP12 was negligible. By in situ hybridization and immunofluorescence, MMP12 was detected in extravillous trophoblasts. With the start of rising oxygen levels at the end of the first trimester, the number of MMP12 positive extravillous trophoblasts declined. Importantly, a transcription factor binding site analysis revealed potential HIF-1 binding sites in the MMP12 promoter. Thus, it is proposed that MMP12 is involved in trophoblast invasion during the first trimester. The urothelium, a stratified epithelium that lines the urinary tract, is highly impermeable for water, ions and solutes and therefore represents a tight barrier for the uptake of drugs such as drug-loaded nanoparticles and their endocytosis. Lojk et al. (2018) have performed a comparative analysis of the uptake by endocytosis of rhodamine B isothiocyanate-labeled polyacrylic acid-coated cobalt ferrite nanoparticles (NPs) using biomimetic urothelial in vitro models. They observed by transmission electron microscopy and spectrophotometric analysis that in contrast to differentiated normal urothelial cells, NPs are efficiently endocytozed by cells derived from human papillary (TR4 cell line) or invasive urothelial (T24 cell line) neoplasms and subsequently transported to the endo-lysosomal system. In addition, NPs showed high time-dependent transcellular permeability in transwell cell chambers. These in vitro results indicate the therapeutic potential of drug-loaded NPs for intravesical application in human bladder carcinoma.